As my summer internship draws to a close at EPI, I thought I’d reflect on some of the things I’ve learned. 1. Time-and-a-half may not be standard for many today, but it should be. Current overtime rules provide nowhere near enough protection for workers. The salary threshold of $455 a week, set by the Fair Labor Standards Act, is actually below the poverty line for a family of four. Further, the “primary duty” test to classify an employee as an executive, professional, or administrator who is exempt from overtime is easily manipulated by employers—unless you actually believe that lots of workers officially classified as managers and supervisors make a lot of organizational decisions while mopping floors and stocking shelves. The impact on millions of workers and their families is stark. I spoke with “managers” with no control over their own schedules who were forced to work grueling 80 hour weeks with salaries of $35,000 and no overtime pay. Some went months on end without a single day off. Their lives are riddled with stress and anxiety. The time they can spend with family and friends has eroded. One store manager was even prevented from seeing her dying niece—called into work despite having scheduled the day off. These stories, unfortunately, go on and on for far too many American workers. Thankfully, President Obama has directed the Department of Labor to update its overtime rule. Hopefully this new rule (scheduled to be proposed in November) will at the very least raise the salary threshold to $984 a week and index it to inflation, as proposed by Ross Eisenbrey and Jared Bernstein. Such a change would benefit 5 – 10 million workers. While this would be a modest step forward, ideally the salary test would be raised even higher—Heidi Shierholz found that a $1,122 threshold would be consistent with historic levels. 2. The vast majority of Americans have seen wages lag overall productivity growth. If there’s a single image that will stick in my mind it’s this graph from Raising America’s Pay. Note: From 1948 to 1979, productivity rose 108.1 percent, and hourly compensation increased 93.4 percent. From 1979 to 2013, productivity rose 64.9 percent, and hourly compensation rose 8.2 percent. * Data are for compensation of production/nonsupervisory workers in the private sector and net productivity (growth of output of goods and services less depreciation per hour worked) of the total economy. Hourly compensation is derived from inflating the average wages of production/nonsupervisory workers from the BLS Current Employment Statistics (CES) by a compensation-to-wage ratio. The compensation-to-wage ratio is calculated by dividing the average total compensation (wages and salaries plus benefits) by the average wage and salary accruals of all full- and part-time employees from the Bureau of Economic Analysis (BEA) National Income and Product Accounts (NIPA) interactive tables. The 2013 compensation-to-wage ratio used in the calculation of hourly compensation was estimated using the growth rate of the compensation-to-wage ratio from 2012 to 2013 from the Bureau of Labor Statistics (BLS) Employer Costs for Employee Compensation (ECEC). 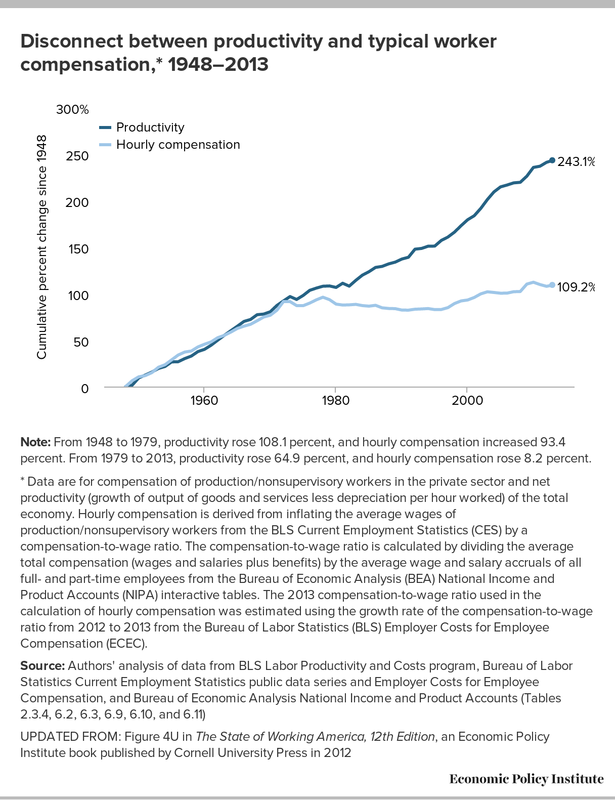 From 1948 until the late 1970s, workers’ productivity and wage gains were tightly aligned. But between 1979 and 2013, average hourly productivity increased by 64.9 percent for nonsupervisory and production workers. Meanwhile, these workers’ wages only increased by 8.2 percent. Workers are, simply, no longer reaping the rewards of their own productivity. And this “excess” productivity has to go somewhere, so, while wages have remained stagnant for the average American worker over the past thirty years, CEO pay has boomed. The ratio of CEO-to-worker compensation has risen from 30-to-1 to 296-to-1. And it wasn’t always like this – the post-WWII decades saw much more equal income growth. While society has gotten fairer and more inclusive in lots of ways in recent decades, it has moved backwards in distributing the fruits of economic growth equitably. In order to achieve wage gains and widespread economic growth measures need to be taken to enact strengthened labor standards, raise the minimum wage (and tipped minimum wage), and protect workers’ right to collectively bargain. 3. Low-wage and immigrant workers can’t even count on receiving the wages they’ve legally earned. More than 2 out of every 3 low-wage workers have reportedly been victimized by wage theft—such as failing to be paid overtime, being paid below the minimum wage, having their wages illegally docked, or being forced to work off the clock. And even working for the federal government doesn’t make workers safe—federal contractors are often among the worst violators. Hopefully, yesterday’s executive order will at least reduce this behavior among federal contractors. 4. Work hard and never compromise on the facts. EPI has built an ironclad reputation on the strength of its research. The place that Paul Krugman once called “the little think tank that could” serves as a great example of the impact that can be made by precise economic analysis and a principled belief in social justice. 5. Overall, my time at EPI has taught me that there is nothing more rewarding than fighting to ensure that hardworking Americans get the fair shake they deserve… it’s icing on the cake when in the process you get to work with such incredibly knowledgeable, generous, and truly wonderful people. I can’t thank everyone enough for their mentorship, for putting up with my puns, and for making this summer such a memorable and meaningful experience.